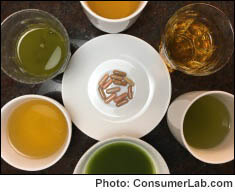 Our tests identified the best green tea supplements, brewable teas, matchas, and bottled teas. See the top picks based on EGCG, polyphenols, caffeine, purity, taste, and cost. Also get the clinical evidence for green tea for heart health, weight loss, memory and cognition and learn about side effects. 1. Is it true that green tea can interact with blood-thinning medications like warfarin (Coumadin) or clopidogrel (Plavix)? 2. It is okay to add milk to green tea? 3. Can green tea help prevent the flu? 4. Does microwaving green tea affect the amount of EGCG or other catechins in the tea? 5. Is green tea from Japan contaminated with radiation? 6. Can I take cholesterol-lowering statin medication with green tea? 7. How does white tea compare to green tea and black tea in terms of antioxidant catechins? How about caffeine levels and lead contamination? 8. I recently purchased some matcha green tea powder claiming to contain up to "137 times the EGCG" that is in brewed green tea. However, the label does not state an actual amount of EGCG and the company would not provide me with any analysis. Is the label true? 9. After developing kidney stones, I was told to avoid tea -- but recently I've heard that green tea might actually be helpful for kidney stones. Is that true? 10. Which bottled green teas have the most EGCG? 11. How significant are the risks to drinking tea from China from heavy metals? 12. Should I worry about getting too much fluoride from drinking tea? 13. Does Gynostemma pentaphyllum really work as an AMPK activator and help for diabetes? 14. Are supplements which claim increased absorption or improved bioavailability telling the truth? Is it worth paying more for these? Are there concerns? 15. Have you evaluated a multivitamin by Vita Logic called Daily Extra? 16. Is there a risk of liver toxicity with certain supplements? 18. When taking a statin drug like Lipitor or Crestor, are there supplements I should avoid or take? 19. Do any supplements help with gum disease or periodontitis? 20. What is Protandim and does it really work? 22. I take warfarin (Coumadin), an anticoagulant drug. Are there supplements I should avoid, or be taking, due to this drug? 23. Can supplements help me lose weight? 24. How much caffeine is really in dark chocolate bars? 25. I read that sterol supplements to lower cholesterol like CholestOff can block the absorption of vitamins. Is that true? 26. Do any supplements really help with brain function, like memory and cognition? 27. Are there supplements I should avoid when taking I apixaban (Eliquis) or similar blood thinner drugs? 28. What is Modified Citrus Pectin (MCP) and is it helpful for prostate cancer? 29. Which supplements should be taken with food? 30. Do any supplements help relieve stress? 31. What is PQQ? Does it help with aging and memory? Is it similar to CoQ10? 32. Which supplements help reduce the risk of colorectal cancer? 33. Are there any supplements I should avoid when taking acetaminophen? 34. Are there vitamins or supplements that can reduce my risk of breast cancer? 35. I've heard that grapefruit juice can interact with medications because it inhibits an enzyme that breaks down drugs in the body. Do any supplements interact the same way with drugs? 36. Which supplements can help me sleep? 37. Which supplements help with depression and anxiety? 38. Can white kidney bean extract really help me lose weight? 39. What is Brain Bright and can it really improve memory or cognition? 40. Which supplements reduce the risk of stroke? Which increase the risk of stroke? 41. With herbal supplements, what is the difference between root powder and root extract? Does it matter? 42. How much should I expect to pay for supplements? Are higher-priced supplements any better than low-priced brands?